P.F. 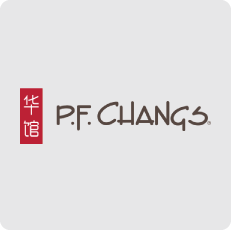 Chang’s is committed to providing you with an exceptional dining experience every time you walk through our doors. Each dish on our menu is prepared to order using the freshest and highest quality ingredients. At P.F. Chang’s, you are surrounded by a unique environment combining influences of Chinese and American cultures. A panoramic, hand-painted mural depicting 12th century China is visible from the main dining room and commands attention as the restaurant’s centerpiece, while several terra-cotta warriors stand guard. Majestic 11 ft. tall horses grace the entrance. The horse symbolizes the original Forbidden City in China, which was built for China’s first emperor Qin Shi Huangdi. These elements showcase the cuisine and create a stylish, comfortable, upbeat dining experience for our guests.